Everyday nearly 2 million people board planes to travel to destinations far from their homes. Many of these people will cross multiple time zones ending up in new locations many hours ahead or behind of what the traveler is used to. Considering our long history as a people, rapid travel is a very new development. One in which people's biological makeup is still having difficulty adjusting to. Many travelers experience difficulty sleeping and trouble staying awake or alert when they arrive at a new location. This common occurence is known as jet lag. Jet lag is a physiological condition that disrupts a person's sleep due to rapid travel across multiple time zones (usually 2 or more) and causes an imbalance to the traveler's circadian rhythm. Your circadian rhythm is an ingrained biological clock that regulates periods of sleep and wakefulness. The circadian rhythm also influences other biological factors such as body temperature, times for eating, and the regulation of certain hormones. These functions are calibrated by a group of cells called the suprachiasmatic nucleus (SCN) located in the hypothalamus. The SCN is connected to the optic nerves and senses changes in daylight that help it regulate certain functions of the body. It uses the presence (or lack) of daylight as it's primary measurement in balancing these functions. It tells us that when there is daylight, that it's time to be awake, and when it is dark, it's time to be asleep. Your circadian rhythm is set to match the environment in which you live in. When traveling long distances over short periods of time, your circadian rhythm is slow to adjust to the new cycles of daylight and darkness. Your body wants to sleep when it's night back home, and to be awake when it's daytime back home. Jet lag manifests when your internal clock is out of sync with your current location's external clock. Jet lag only occurs when traveling in westward or eastward directions two or more time zones away. Jet lag does not occur when traveling northward or southward (even over long distances) unless multiple time zones are crossed. Symptoms of jet lag can vary due to factors such as direction of travel, and how many time zones crossed. The more time zones crossed the more severe your symptoms will become due to the vast time differences between your new destination and the location of your home. Depending on the direction of travel, your symptoms in your new destination will differ. Eastward travel, where you "lose" time, will have different effects on your circadian rhythm than westward trave,l where you "gain" time. Age also plays a factor in the severity of jet lag symptoms and the time it takes to recover. 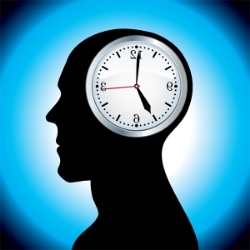 Older adults usually have more difficulty adjusting to time differences than younger adults and children. Other factors present during travel can cause problems. Being cramped up during long flights can lead to leg, back, and other muscle discomfort. The pressurized air in the cabins of planes lowers the amounts of oxygen in the blood leading to headaches, dehydration, and a general discomfort. Fortunately for most travelers, jet lag is a temporary condition that can be quickly remedied and rarely requires professional intervention or therapy. As a general rule of thumb, when traveling east it takes about one day of recovery for each time zone crossed, and half the amount of time for westward travel. Jet lag has a maximum circadian rhythm disruption of up to twelve hours. • Adjust your schedule in advance. Before traveling begin by trying to adapt to the sleep patterns of your new destination. If traveling east, begin going to bed 30 minutes earlier each day until you're closely in sync with the bedtime of your future location. If traveling west, do the opposite by staying up a little later each night. • Arrive early. If traveling for work and want to be awake for important business, arrive at your destination early to give you more time to adjust to the new schedule. • Expose yourself to natural light. 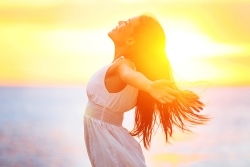 Your circadian rhythm is greatly influenced by sunlight exposure. Getting out into the daylight at key times can help you adjust your body clock much faster. When traveling west, expose yourself to outside light early in the mornings but avoid it during late afternoons and evenings. When traveling east, avoid early morning light, and expose yourself to late afternoon/evening light. Artificial light can also to treat jet lag in similar ways that it is used to treat shift work sleep disorder and seasonal affective disorder. However, if considering bright light therapy, discuss it with your doctor first to make sure you're getting the right amount of exposure at the right times. • Avoid alcohol and caffeine. Caffeine is a stimulant and its effects can last much longer than desired making getting into a new sleep routine difficult. Alcohol makes you drowsy, and many believe that it helps induce sleep. While it's true that alcohol can aid in falling asleep, it often disturbs your sleep and reduces the quality of sleep with frequent awakenings and trips to the bathroom. • Take melatonin supplements. Melatonin is a hormone that is secreted by our bodies to help us fall asleep. Taking 3 milligrams of melatonin supplements approximately 3 hours before bedtime can help aid in falling asleep. However, not all research concludes that melatonin supplements are effective in treating jet lag. If you're considering using melatonin for jet lag treatment, ask your doctor for recommendations first. • Drink plenty of water. To avoid dehydration and headaches on long flights, keep yourself well hydrated by drinking plenty of water and avoiding alcohol and caffeine. • Use sleeping aids. If you're trying to sleep on the plane in anticipation of your new upcoming sleep schedule, try using blindfolds to block out light, earplugs to block out noise, and a neck pillow to get as comfortable as possible. • Consider medications. Talk to your doctor about taking medications that can promote wakefulness if trying to adapt to eastward travel, or sleep medications for westward travel. 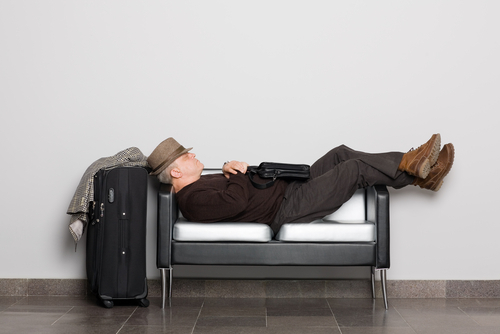 For most travelers, jet lag is easily remedied after a few days in a new location. However, if your trip is only a few days long before you plan on returning home, it is often best to maintain your regular schedule so that you're not once again readjusting to a new time when you arrive back home shortly. For frequent flyers, pilots, flight attendants, and airline crew, jet lag can become a recurring problem. If you fit into this category of flyers, you may want to consult with a sleep specialist. Sleep specialists are highly trained in helping people shift their circadian rhythms by offering advice and prescriptions for a variety of treatments including bright light therapy, melatonin supplements, and other medications. At the Alaska Sleep Clinic we help thousands of Alaskans combat their sleep disorders and problems every day. If you're concerned about the impact on your health from frequent flying and are looking to speak with one of our sleep experts, click the link below for a free 10 minute phone consultation.